The Roboklin 25 is designed to wash large ground mount PV panel arrays affordably. It is ideally positioned to help O&M’s optimize their return on multi-million dollar plant investments. 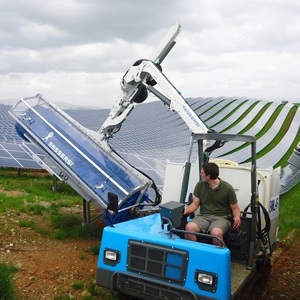 With a wash speed of 80 feet (25 meters) per minute and four brushes from 6′ to 13’9″ in length, one operator can effortlessly wash 12,000 solar panels per 8 hour shift, with only 4,500 gallons of water. Looking for top notch panel wash machines? We designed Roboklin 25 to wash large ground mount PV panel arrays with ease and affordably. For Instance, this machine is ideally positioned to help O&M’s optimize their return on multi-million dollar plant investments. In addition, the Roboklin is the fastest machine on the market to wash large flat panel power-plant-size installations. With a wash speed of 80 feet (25 meters) per minute and four brushes from 6′ to 13’9″ in length, one operator can effortlessly wash 12,000 solar panels per 8 hour shift, with only 4,500 gallons of water. Here at Bitimec we make cost effective machines which wash faster, better, for half the price with a quarter of the water! So, we think you may also be interested on our Irci-Wash Bot model. Check it out and be amazed! We designed Wash-Bot machines to make the job easier and faster. While using far less water, detergent, manpower and time than conventional vehicle washing methods. One person easily operate Roboklin machine.